The interior of this gorgeous condo has been recently renovated and completely modernized from top to bottom. The design features hand-painted artwork, high-end furnishings, sheet rock granite, and a stunning brick fireplace that all come together to create an unforgettable mountain escape. Massive windows and sliding glass balcony doors give the unit a spacious feel and also an abundance of natural light. While relaxing in the living area or on the main balcony, you will enjoy access to some of the most spectacular scenery – this unit boasts the best views in the entire village. With three bedrooms, two full bathrooms, and enough bedding to comfortable sleep eight adults, this 1,392 square foot unit is guaranteed to please families and friend groups. You will find that the condo comes stocked with all of the items essential for a great vacation: Central heating, a gourmet kitchen that is fully stocked with plate ware and cookware, multiple flat-screen TVs with cable and DVD players, high speed wireless internet, and more. Each of the three bedrooms features plush sleeping arrangements and access to one of the unit’s private balconies. The master suite guest will enjoy a queen bed and views of Maggie Pond/ Quicksilver Chairlift while guests in the spare queen bedroom and twin bedroom will have views of the ski school and plaza. The double vanity guest bathroom provides ample space for busy mornings and also provides great views of the ski runs. After a day on the slopes, you can choose to enjoy your meals around the beautiful wood table in the adjacent dining area, with seating for 8 people, or at the barstool seating at the kitchen counter. In terms of location, it is nearly impossible to beat the Village at Breckenridge! 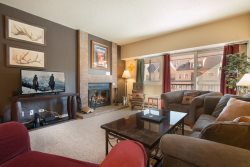 The resort is known for its prime location and for being a true ski-in / ski-out property. Resort amenities include indoor/outdoor pool, hot tubs, sauna, steam room, exercise room, cable TV, and free wireless internet. Because the property is half a block from downtown, you won’t need a car - skiing, outlet stores, restaurants, and more are only a short walk away! In the summer, head over to the nearby horse stables for a scenic scenic ride, or explore any of Breckenridge’s many hiking trails. Location, Views, Location! Great place for the family over July 4th. Close to everything. Will be staying here again. Ski Colorado couldn't have been nicer or more helpful! Great location, stylish interior, well equipped, two spacious balconies, and great views! Excellent! We stayed in this well equipped and lovely condo for our daughter's wedding week in Breckenridge. It has wonderful views from two spacious balconies, a perfect location in Breckenridge, and is part of the Village at Breckenridge with it's fabulous staff. The property management company Ski Colorado Vacation Rentals couldn't have been nicer and more helpful. Fathers Day Trip! Awesome place in prime location! Perfect place to stay. Everything is s close. You can go to slope by walking Leds than 2 minutes and the main street is less than 5 minutes. I Will recommend to all of you. This was a great place to stay. Very modern and clean. The views are great and it is just steps away to a ski run along And the town of breckenridge. The only thing I want to point out is that the pool and hot tubs are about a 5 minute walk away from the building the apartment is in. Not a big deal but something that was mildly inconvenient when it is cold out. Great location. Great condo. Very clean and well equipped. Communication and check in/out was smooth and easy.